Accounting for nearly a quarter of the country’s population, students are among the top customers of the health insurance sector. As the future of the country, the care for comprehensive material and physical growth is one of top priorities of the people’s health care, protection and improvement strategy. A quarter century ago, urgent issues of people’s health care and protection were raised. When the country entered the renovation period and abolished subsidies in all areas, the Central Executive Committee (seventh term) issued Resolution 04/NQ-HNTW dated January 14, 1993 on timely orientation, leadership, guidance and solution to address hardships and shortcomings, had reasonable policies and created sources for continuing and developing operations of the health system. Accordingly, the country’s health insurance development policy advocated mobilising community resources and State resources to care for and protect the people's health in the new context. At that time, the care and protection of students' health - the future of the country - also faced enormous difficulties and inadequacies and lacked investment resources. School health was seriously degraded and school diseases rose to alarming levels and affected educational quality and objectives. If students unfortunately suffered from diseases, their families were caught in a poverty trap. Human resources and social security policies caused negative impacts. Understanding its responsibility for youth health and receiving the active advice and suggestions from concerned bodies, the Ministry of Education and Training and the Ministry of Health issued Joint Circular 14 /TTLB on September 19, 1994 on instructions for the deployment of voluntary health insurance for students, marking the birth and development of student health insurance policies in the country. Launched nearly one year after the compulsory health insurance policy, overcoming the twist and turn of development, with its superior nature of goodness, rich humanity, practical benefits and valuable practice, student health insurance has proved and confirmed its tremendous role and effect. This policy was consented to and supported by society and legalised by the Law on Health Insurance which stipulated mandatory implementation and premium support from 2015. As a result, this has immensely progressed in recent years. In 2018, over 92.5 per cent of students in the whole country are health-insured. 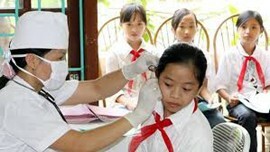 Health insurance is recognised as a “new breeze of wind that reviving the school health network”, an effective solution to assist families of students who are at risk of illness or accidents to have insurance coverage for medical examination and treatment expenses, especially in cases of severe illness which may require up to billions of Vietnamese dong. More importantly, through the health insurance, students have their health protected and improved, helping shape a healthy and civilised environment, lead a happy and secure life in a society full of love, humanity, solidarity, assistance and sharing. In that sense, student health insurance has drawn special attention of the Party, the State as well as the sympathy and support of the whole society. The Law on Amendments and Supplements to a number of articles of the Law on Health Insurance, effective from January 1, 2015, defines the task of developing student health insurance specifically for the education sector. Particularly, with Directive 05/CT-TTg dated April 4, 2015 on enhanced carrying out of social insurance and health insurance, the Government assigned the Ministry of Education and Training to work with the Ministry of Health and the Vietnam Social Security to cover health insurance for 100 per cent of students. In Decision 1167/QD-TTg dated June 28, 2016 on adjusting allocations of health insurance norms for the 2016 - 2020 period, the Prime Minister requested concerned bodies to accelerate the implementation of health insurance. The new school year 2018-2019 already arrived but a small number of students have not had health insurance policies yet. Some existing shortcomings and constraints also need comprehensive, synchronous and drastic solutions. Before this reality, the good nature and practical benefits of health insurance policy as well as the trust, responsible involvement of the political system and the social community, the student health insurance system will surely continue to be a new solid step of development to cover all people and importantly help realise the target of universal health insurance of the Party and the State.